This sequential, three-course program provides the perfect combination of course material and interactive multimedia resources. Teen Health helps students understand that good health affects their school performance, their friendships, their looks, and their lives. Teen Health stretches far beyond traditional health topics to cover the subjects your students really want to know about. It explains the importance of avoiding risky behaviors and provides step-by-step guidelines on how to do so. TIME Health articles present health-related content in a fun, lively, magazine-style format and are accompanied by an activity tied to article content. Foldables Study Organizer gives students the opportunity to create a hands-on reading and study tool to help them develop reading skills and prepare for quizzes and tests. Building Health Skills combines positive role-modeling of featured skills with practicing those skills and then performing the skills and evaluating the performance. 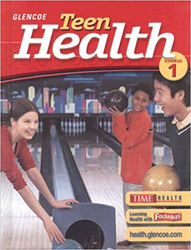 Health Skills Activities present point-of-use reinforcement for integrated skills into core health knowledge. Hands-On Health features are science-based experiences requiring little scientific equipment to illustrate various health concepts. Character Education helps students understand, appreciate, and act on core ethical values. Media Watch raises awareness about the media's impact on lives and health. Connect to. . . provides cross-curriculum activities to help students see how health is related to other areas such as science, mathematics, language arts, and social studies.